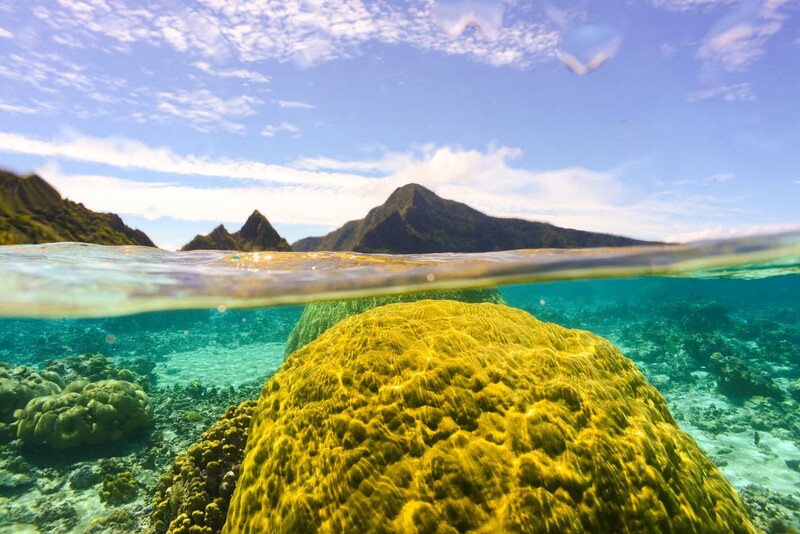 The picture above was taken on Ofu Island in American Samoa, where I spent two weeks in the summer of 2013 to work on an interdisciplinary coral reef imaging and mapping project. 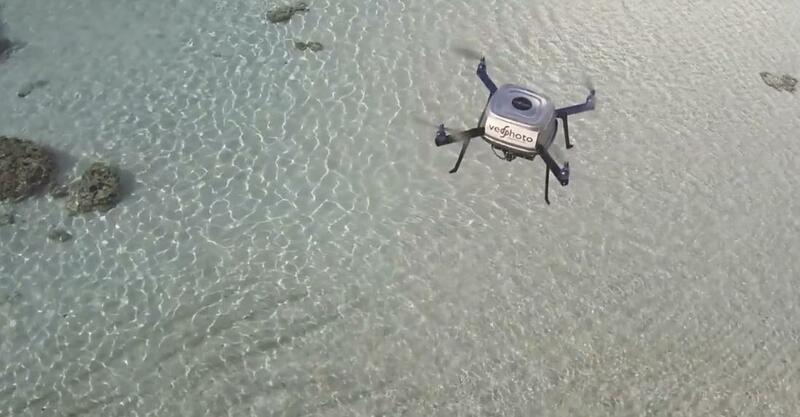 The project, called Reactive Reefs, is run in collaboration with Ved Chirayath and Trent Lukaczyk, both graduate students at the Department of Aeronautics and Astronautics at Stanford University. Reactive Reefs is a project with two purposes. The first is to acquire scientific data; creating a map of the reef in Ofu by aerial imaging that provides high enough resolution to monitor coral growth. The second purpose is science outreach; to increase public awareness about the current state of coral reefs. But how does a cell biologist end up working with engineers and get to go to a paradisiac island? Here is the story. It all started in June 2012 when Ved asked me if I would like to help out with a coral-imaging project. The purpose was to test a technique called Fluid Lensing that he had developed. Being a professional photographer in addition to a grad student, he wanted to have aesthetically appealing and scientifically interesting test objects. As the name suggests, Fluid Lensing uses fluids as a lens and allows imaging of shallow subsurface targets with minimal artifacts and distortion. Have you ever looked at the lane lines at the bottom of a pool as waves move over it? While doing so, you might have noticed how the waves can act as a magnifying glass, and for a short moment you can see the lane lines clearer than when the surface of the pool was absolutely smooth. Now imagine, you took thousands of pictures such that each spot at the bottom of the pool was captured at least once in that exact moment when a wave acting as a magnifying glass was moving over it. By combining all those pictures into one, you could get a super-high resolution image of the bottom of the pool, even though when you stood there as the waves were perturbing the water surface, it wasn’t possible to get a clear image. Of course, before we could apply Fluid Lensing on images of the reef in Ofu, we needed to test our equipment in a more controlled environment. We tested the small electric quad-copter that was going to be used for the aerial imaging of the coral reef at the Stanford pool. A quad-copter is a flying craft with four rotors placed at the ends of two arms that form a cross. The one we used in Ofu is shown in Figure 2. Trent, our quad-copter operator, flew it 25 meters above the pool (the height from which the reef was imaged) and Ved tested the Fluid Lensing algorithm on the lane lines. My duty was to generate waves by swimming back and forth in the pool to simulate the situation in the ocean (a pleasant way to combine work and workout). To acquire the underwater panoramas and time-lapse images to be used in the science outreach exhibition, we needed a tripod that could withstand the power of waves. For this test we went to Catalina Island near Los Angeles. Soon after getting into the freezing water we realized that the tripod needed considerably more weight on it to avoid being thrown around like a leaf. With an additional 25 kilograms of weight we managed to get it steady. Finally, in August 2013 came the moment of truth. Our team travelled to Ofu to generate maps of the coral reef on the southern side of the island using Fluid Lensing with images taken from the quad-copter equipped with a GoPro camera. By the end of the two weeks we had generated one of the highest-resolution optical maps of subsurface marine targets to date. Part of the map that was generated is shown in Figure 3. These maps will enable high-throughput monitoring of coral growth and health over time. Growth monitoring is currently a tedious process where researchers have to swim out to the reef, tag corals, measure their sizes, take pictures, and go back to the same coral after some period of time. As it is difficult for one researcher to travel to these remote islands frequently, hand-drawn maps are used to enable other researchers to locate the corals. As you can imagine, often it is nearly impossible to locate a coral based on a map that someone else has drawn. The new imaging technique will not only provide accurate maps but also allow monitoring of a larger number of corals with far less manpower. 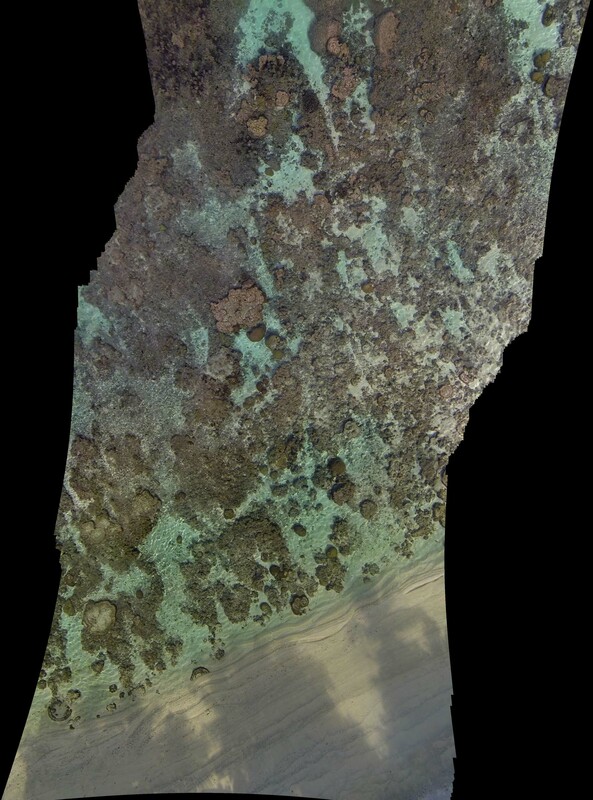 We can also generate 3D reconstructions of the reef (click on the link to see the 3D reconstruction) because the quad-copter takes multiple images of the same spot from different viewpoints as it flies over the reef. As mentioned above, in addition to providing scientific data, Reactive Reefs is also a science outreach project. In summer 2014, we will host an immersive photography exhibition that aims to transport the audience beneath the ocean’s surface to discover firsthand how the world’s coral reefs change as a result of both natural and human pressures. We will present some of the first high-resolution gigapixel underwater imagery composed of thousands of high-dynamic-range photographs to provide a more realistic, natural image that surrounds the viewer in a 360-degree panorama (Figure 5). Sound recordings from the reef in Ofu and life-size coral corridors (Figure 4) will add to the immersive experience. The exhibition also will include interactive features. Smartphone applications will allow users to turn their handset into a window to look around and explore the underwater world. Lenticular images (similar to postcards with a grooved plastic cover where the image changes depending on the angle you look at it) will appear to move as visitors walk past. Finally, a virtual ocean provided by the Virtual Human Interaction Lab at Stanford will allow people to “swim” in it by wearing a head mounted display. Before taking a “swim”, visitors will be able to take a questionnaire about their waste generation behavior. During the “swim” the virtual ocean will then fill up with the estimated amount of waste generated by the particular visitor in one year. It is our hope that this experience will increase people’s awareness about coral reef and ocean conservation. 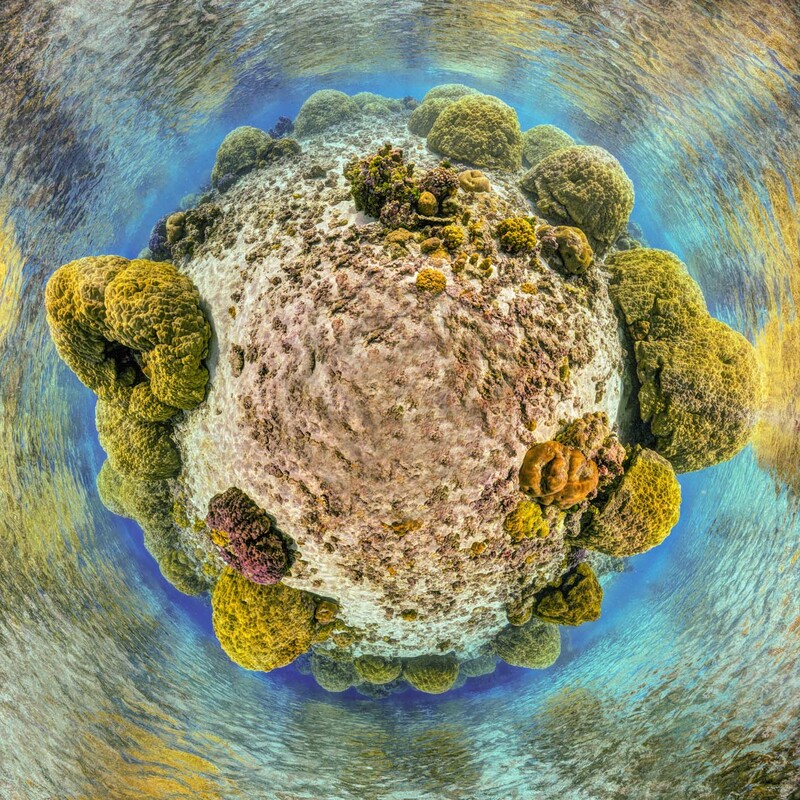 If you would like to learn more about Reactive Reefs and read up on the latest progress, please visit our website, and if you happen to be in the Bay Area in summer 2014, come by our exhibition! Tamaki Bieri is a 2010 fellow of the Fulbright Science and Technology Award Program, from Switzerland, and a PhD candidate in the department of Biology at Stanford University.